This one's a fun one, because the inventor is from our home town! Katie invented the Paw Wash when she was in sixth grade. She was awarded a U.S. Patent for the concept, and has won numerous design awards for it ever since. We love being able to support a hometown girl! 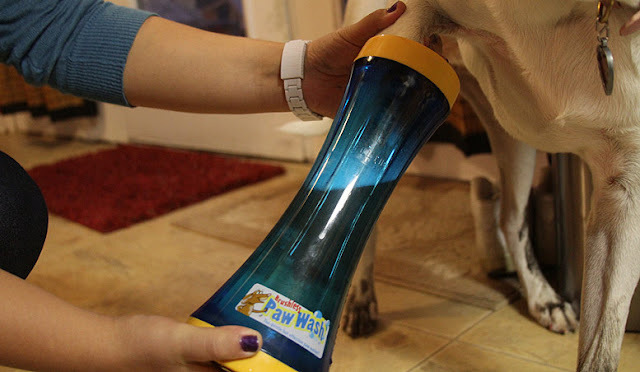 The Paw Wash can be purchased online at www.thepawwash.com. This week is Petfinder's Adopt a Less-Adoptable Pet Week. Did you know black cats are often the first to be euthanized in shelters due to the fact they are considered less adoptable? Right now, there are over 20 black cats and kittens at the shelter where we volunteer. Thankfully, these guys don't need to worry about euthanization - but they need forever families. Won't you consider adopting a less adoptable pet? We think the notion of "less" adoptable cats is very misguided!!! We have a deaf cat AND a black cat and they are both wonderful. There is nothing less about them in fact they are more loving and more gentle that just about any cat I have ever met. That's pretty cool that another 'Katie' invented the paw wash! But don't think for a minute that I'M gonna stick my paws in that thing! haha! ...Glogirly tells me that the kitty who came before me was an all black kitty. Nicki was his name and his picture is by my food dish. She loved him a LOT. And was shocked to learn that black cats are sometimes considered less adoptable. ...I mean, sheesh...her whole wardrobe is black! How on earth can a black cat be anything BUT fabulous!? We agree! Mommy tells us that we three are technically all black kitties genetically...with modification genes turned on! We just nod patiently and wait til she's done and then we yawn. Super le lavage de patte. We think we would rather wash our own paws thank you. We hope those kitties get adopted. Our mum used to have 2 black brothers. *licks paws* Yup, much more efficient! Figures a woofie would need help washing his paws. Paw wash? Seriously? Oh yeah--I'd like to see the Human that tried to put MY precious paw into that thing. Good luck. I hope the blood bank will be standing by. MOL Spitty! I'm with you on that! Love the Paw wash in theory at least!!! Not sure JJ or I would stay still long enough! Thanks for reminding everyone about black pearls like me!